Georgie Fleming is in the fourth year of a combined PhD / Masters degree in Clinical Psychology at the University of New South Wales. She is a registered Psychologist, and has a clinical interest in young children who display disruptive behaviours. She has had experience in delivering empirically-supported interventions to the families of clinically disruptive children at both the UNSW Psychology Clinic and Rivendell Child Unit at Concord Hospital. She has received extensive training in the application of Parent-Child Interaction Therapy (PCIT), under the supervision of A/Prof Eva Kimonis at the UNSW Parent-Child Research Clinic, and has been recognised as certified PCIT therapist. Georgie completed her Bachelor of Arts (Psychology) (Honours) in 2012 at the University of Sydney. Her Honours project was a randomised control trial (RCT) that investigated the factors affecting the accuracy and credibility of preschoolers’ testimony as victims and/or witnesses of crime. Georgie received a high distinction for her project, and was the recipient of Honours First Class and the University Medal. She is currently conducting a RCT evaluating the efficacy and acceptability of Internet-delivered PCIT (I-PCIT) as part of her PhD research. 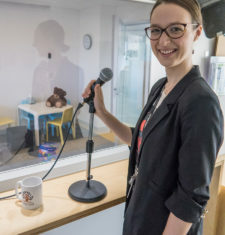 She is passionate about using novel delivery methods to increase community awareness of and access to evidence-supported treatments, especially in rural and remote communities.